This class represents a composition of other SCEV predicates, and is the class that most clients will interact with. This is equivalent to a logical "AND" of all the predicates in the union. NB! Unlike other SCEVPredicate sub-classes this class does not live in the ScalarEvolution::Preds folding set. This is why the add function is sound. Definition at line 397 of file ScalarEvolution.h. Union predicates don't get cached so create a dummy set ID for it. Definition at line 12268 of file ScalarEvolution.cpp. Adds a predicate to this union. Definition at line 12305 of file ScalarEvolution.cpp. References assert(), llvm::SCEVPredicate::getExpr(), and implies(). Referenced by llvm::PredicatedScalarEvolution::addPredicate(), llvm::ScalarEvolution::forgetValue(), and llvm::PredicatedScalarEvolution::getAsAddRec(). Definition at line 433 of file ScalarEvolution.h. We estimate the complexity of a union predicate as the size number of predicates in the union. Definition at line 430 of file ScalarEvolution.h. 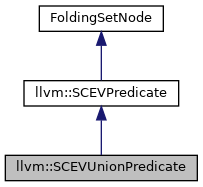 Returns the SCEV to which this predicate applies, or nullptr if this is a SCEVUnionPredicate. Definition at line 12298 of file ScalarEvolution.cpp. Definition at line 411 of file ScalarEvolution.h. References llvm::ARM_AM::add, llvm::Depth, llvm::HexagonMCInstrInfo::getExpr(), N, and llvm::SCEV::print(). 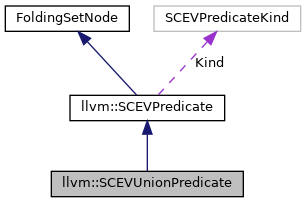 Referenced by llvm::LoopVectorizationCostModel::computeMaxVF(), and llvm::SCEVExpander::expandUnionPredicate(). Returns a reference to a vector containing all predicates which apply to Expr. Definition at line 12277 of file ScalarEvolution.cpp. Returns true if this predicate implies N.
Definition at line 12284 of file ScalarEvolution.cpp. References llvm::all_of(), llvm::any_of(), llvm::DenseMapBase< DerivedT, KeyT, ValueT, KeyInfoT, BucketT >::end(), llvm::DenseMapBase< DerivedT, KeyT, ValueT, KeyInfoT, BucketT >::find(), llvm::SCEVPredicate::getExpr(), I, and llvm::SCEVPredicate::implies(). Referenced by add(), llvm::PredicatedScalarEvolution::addPredicate(), and llvm::ScalarEvolution::getWrapPredicate(). Definition at line 12271 of file ScalarEvolution.cpp. References llvm::all_of(), I, and llvm::SCEVPredicate::isAlwaysTrue(). Referenced by llvm::LoopVersioning::annotateInstWithNoAlias(), and isLoadConditional(). Prints a textual representation of this predicate with an indentation of Depth. Definition at line 12300 of file ScalarEvolution.cpp.